Hi there! It's Friday, again! 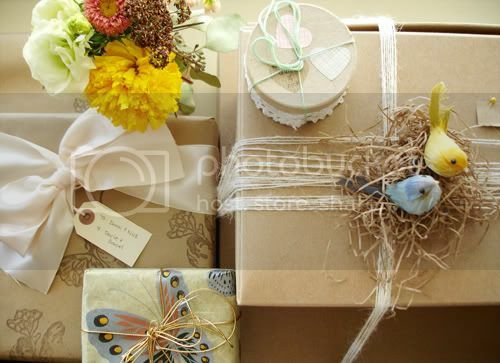 Not really sure what happened to Monday through Thursday but Happy Friday :) I love pretty gifts, don't you? I mean, I really appreciate a well-wrapped present. The above gifts are from my cousin, my aunt, and my 2 friends: mye and ruby. What are your weekend plans? This weekend I am going to my sweet little friend's 13th birthday party, and we may go to the flea market on Sunday. 15 more days. yikes, I think I am panicking now! oh my goodness~! i LOVE ruby's gift! 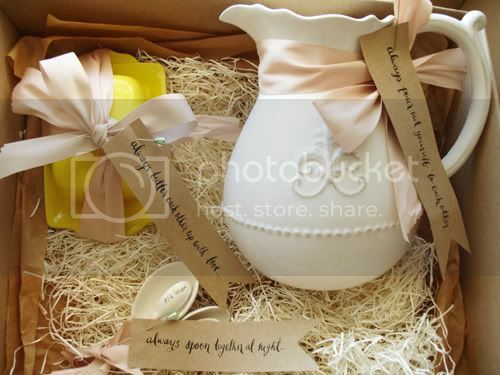 such a creative idea for a wedding gift with a personal touch! i raelly LOVE that pitcher, such a beauty!! you can do it girl, i'm soo excited for you!!! :) have a great weekend! Oh wow! Ruby is amazing! What wonderful gifts! And the packaging is all so beautiful! I would've been so sad to open them all and mess up all that hard work! what a great gift package, so creative and thoughtful! Planning to go for a hike over the weekend - enjoy your last moments as a single girl - it is also precious! Very creative! What a thoughtful gift. Have a great weekend!! Ruby's gifts are way too creative for words! So stunning. And your photography is so admirable. Is there anything you can't do? Seriously. I usually put just as much thought into the wrapping as I have the gift - it is the best part to me. I can't believe how well coordinated those gifts are, they look like they were from the same person. What a lovely surprise inside too! I have a blogoversary contest going on, so this weekend I will choose the winners... with the help of two nice visitors I'm expecting tomorrow. We're going to a market and I'm also going to moderate a political debate in the town square... I'm finishing up a line of calendars for my shop... and oh, we shall be having lots of fika. you know what i hate? christmas gift-wrapping at malls. I really like her gift too. The pitcher is beautiful. Where are the spoons from? Are they also from anthropologie? SOOOOOOOOOOOOOOOo pretty. Its always so nice to have a pretty package. Pretty wrapping! And a very thoughtful wedding gift. What beautiful gifts - adore that pitcher and the fabulous wrapping. How absolutely lovely! So thoughtful and sweet. those are absolutely creative and beautiful! good luck with the wedding! the most important thing is don't stress! what will be will be and you will have a great day. All those gifts are so beautifully wrapped. 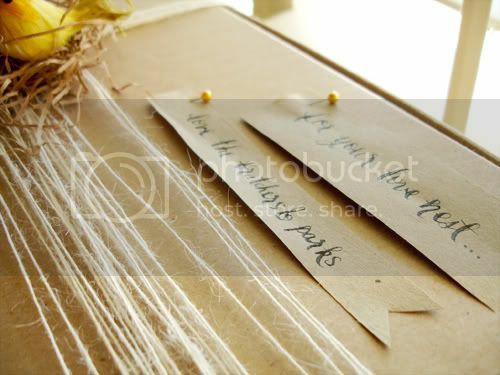 I love the little sayings she attached to the gifts in the last photo...very pretty. thoughtful wrapping is just as exciting to me as the gift itself. ruby's tags are so sweet, what a cute idea! i don't think i could take the gift out, it's just too beautiful wrapped! Great gifts! You can see that a lot of thought went into buying and preparing them! You're lucky to have such great friends! Also, I'm helping promote my brothers band, The Great Flood Catastrophe, new music video. Oh my goodness, this is the most beautiful, thoughtful gift I've ever seen! What a sweet way to give advice, too! What an incredibly thoughtful way to spice up a wedding gift. I absolutely love what she did...so classy with such sweet messages! Will definitely put that one in the back of my mind for future wedding gifts. Very creative! What a thoughtful gift. Have a great weekend! !Thank,s for so ice sharing.